Deep in the winter we crave a bright, fresh salad and have so little fresh fruits and vegetables to choose from. This salad uses quinoa as a base instead of the traditional gluten base in tabouli. It also replaces the traditional tomato and bell pepper with pomegranate seeds and celery. It keeps much of the rest of the traditional tabouli flavor. Toss all the ingredients together in a bowl large enough to do thorough tossing. Make any necessary adjustments and serve. This salad is best at room temperature. It stays fresh and nice up to three days in a tightly covered container in the refrigerator, but do take it out an hour before meal time to take the chill off. 18 Comments on "A tabouli-like salad for the cooler months (and gluten free as a bonus)"
This looks really interesting. It is dumb question time… I have only encountered pomegranates a couple times in my life. There’s a delicious pulp around a seed, and it’s the pulp you are after. Is it okay to eat the inner seed, or is there an etiquette to discreetly spitting them out? Great question Stealthy Mom! We live in pomegranate country and I have never seen anyone spit them out. They are definitely edible. I love this simple salad made with healthy natural ingredients especially the pomegrantes Great picture too..
What a lovely salad. I made one similar using millet back in Oct. http://www.beyondthepeel.net/2011/10/millet-pomegranate-salad-with-a-basil-chimichurri-dressing.html for the WWC I was hosting. I look forward to trying yours with the lemon balm and quinoa. Looks delicious. What the heck is lemon balm? Looks like another keeper, though i had no idea what quinoa was till 2 minutes ago. I’ll see if can find any in the local stores. So glad to find another quinoa recipe. I bought some for the first time a few weeks ago and have only cooked it once. Kids weren’t crazy about it, but this might work for them. I know it will work for me! Loving this recipe right now, I am on a pomegranate kick, just love them!! Plain, or mixed in I haven’t found anything they don’t do well with. I am hosting a Holiday Treats Week on my blog next week I hope you will stop by and link up some of your recipes. Just made this–very tasty and very pretty. 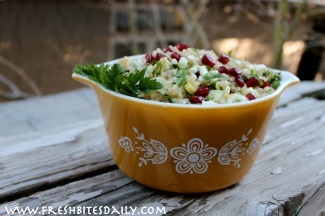 The green parsley and red pomegranate seeds make it seasonally festive too. Your salad looks beautiful, and I love all the ingredients. Pomegranate if a favorite at our house. Thanks for sharing it at Gluten-Free Wednesdays. 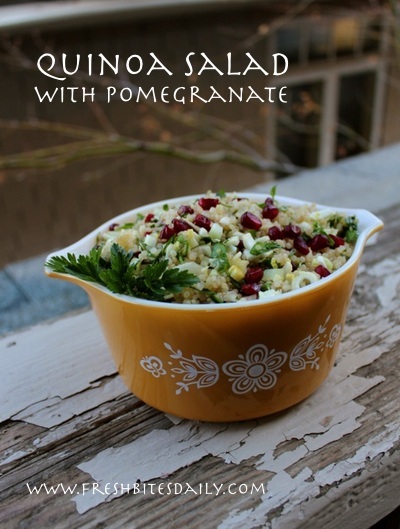 Quinoa and pomegranate – two of my favourite things – can’t wait to try them together! What a great combination for a salad. I have been using a lot of pomegranate lately and just love it. Your salad looks delicious and very pretty. Thank you so much for sharing with Full Plate Thursday. Hope you are having a great week and come back soon! Thanks for sharing this recipe with My Meatless Mondays. It exemplifies what we can eat without meat and be healthy, attractive and delicious. We are featuring this, later today so come on over and feel free to bring more food.